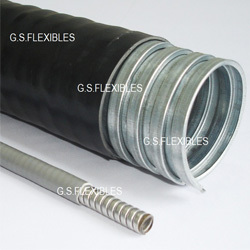 GSF Liquid Tight Conduits are Metal Flexible Conduit with PVC covering on top. It has square lock formation and is moderately flexible. It is Liquid Tight and is particularly suited for data cables. PVC covering on top also provides moderate insulation against accidental electric shock. The product is manufactured in Hot-Dipped Galvanized Steel as a standard. It’s also available in Stainless Steel on request. Standard conduit is furnished without any packing .It is available in all standard sizes from I.D. = ¼ through I.D. = 4. Custom sizes are also available upon request.